The most recent downgrade by the Fitch rating agency that leaves Russia just one step away from ‘junk’ status won’t have a dramatic impact on the economy, Russian economists have told RT. “A Fitch downgrade will have a limited effect on the Russian economy, as the situation is already tense,” Vladimir Tikhomirov, chief economist at BCS Financial Group told RT by phone. He also said that Russia has limited access to international finance after the US and the EU imposed sanctions on the country’s financial sector. Aleksandr Prosviryakov, treasury and commodities consultant at PwC Russia, also says the worst happened back in spring 2014 when the West imposed sanctions. “Russia is already trading at yield levels above Lebanon, which is rated at six notches below at B-. Most international institutional investors started to sell their holdings of Russian assets in March 2014 after the first sanctions were announced,” he said. Tikhomirov says the most important thing is that Russia remains at investment grade. However, he warns of more risks to the Russian rating, saying the country’s economy is poised to slow down in 2015, as both investment and consumer demand will shrink. “There’s 40-50 percent likelihood that Russia will be downgraded to ‘junk’ status. If it happens the Russian market will start falling sharply and the pressure on the ruble will increase,” Tikhomirov added. He said the Fitch assessment just put it in line with S&P which downgraded Russia in December. Then S&P revised Russia’s rating to BBB-, saying there is a 50 percent possibility it’ll drop Russia to junk level in mid-January 2015. Prosviryakov was more optimistic, saying no further downgrades will reflect the real situation in Russia’s economy, as the current figures evidently indicate better performance. “It is obvious that a country with US$400 billion of reserves and a public debt of 12 percent of GDP cannot be considered as ‘junk’. The ratings do not reflect the reality anymore,” he said, adding that Russia received an investment grade rating in 2004 when it had $80 billion of reserves and the oil price was around $35. “It is also interesting to note that last week the Chinese agency Dagong maintained Russia's rating at A, which is one notch above USA's A- rating,” Prosviryakov said. Given that Russia does not issue foreign debt any more, the possible rating downgrade will not have a material effect on the economy, he said. However, talking about the Russian economic outlook in 2015, Prosviryakov said the economy this year is set to have negative growth dynamics. Nevertheless, he said a turnaround is possible if there is a sharp rebound in oil prices in the second half of the year, as the steepness of the decline also depends on the prices of Russia’s main export products, which are linked to the oil price. 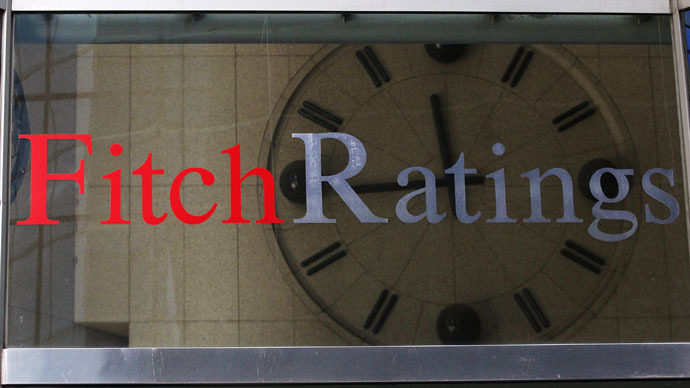 On Saturday international ratings agency Fitch downgraded Russia’s credit rating by one notch from BBB to BBB- with a negative outlook, leaving the country a peg above the non-investment rating known as ‘junk’ status. The rating agency explained that Russia’s economic profile was becoming increasingly fragile amid sanctions, slumping oil, the currency crisis, and capital outflow.